A just society must strive with all its might to right wrongs even if righting wrongs is a highly perilous undertaking. But if it is to survive, a just society must be strong and resolute enough to deal swiftly and relentlessly with those who would mistake its good will for weakness. In 'Thoughts on the Present', First Things, Last Things (1971), 101. But the One was Me. 'Fifth Philosopher's Song', Leda (1920),33. All of modern physics is governed by that magnificent and thoroughly confusing discipline called quantum mechanics ... It has survived all tests and there is no reason to believe that there is any flaw in it.... We all know how to use it and how to apply it to problems; and so we have learned to live with the fact that nobody can understand it. Beyond a critical point within a finite space, freedom diminishes as numbers increase. ...The human question is not how many can possibly survive within the system, but what kind of existence is possible for those who do survive. But does Man have any “right” to spread through the universe? Man is what he is, a wild animal with the will to survive, and (so far) the ability, against all competition. Unless one accepts that, anything one says about morals, war, politics, you name it, is nonsense. Correct morals arise from knowing what man is, not what do-gooders and well-meaning old Aunt Nellies would like him to be. The Universe will let us know—later—whether or not Man has any “right” to expand through it. In Starship Troopers (1959), 186. Dr. Wallace, in his Darwinism, declares that he can find no ground for the existence of pure scientists, especially mathematicians, on the hypothesis of natural selection. If we put aside the fact that great power in theoretical science is correlated with other developments of increasing brain-activity, we may, I think, still account for the existence of pure scientists as Dr. Wallace would himself account for that of worker-bees. Their function may not fit them individually to survive in the struggle for existence, but they are a source of strength and efficiency to the society which produces them. In Grammar of Science (1911), Part, 1, 221. Education has, thus, become the chief problem of the world, its one holy cause. The nations that see this will survive, and those that fail to do so will slowly perish. There must be re-education of the will and of the heart as well as of the intellect, and the ideals of service must supplant those of selfishness and greed. ... Never so much as now is education the one and chief hope of the world. Confessions of a Psychologist (1923). Quoted in Bruce A. Kimball, The True Professional Ideal in America: A History (1996), 198. In 'New Methods and New Aims in Teaching', New Scientist (21 May 1964), 22, No. 392, 484. One of several articles on the theme, 'Education in 1984'. Even the humblest creature has to know how to react to the difference between food and toxin if it's to survive. ... Life and some level of intelligent behavior—discerning and doing what's best for one's survival—appear to go hand in hand. In Life Everywhere: the Maverick Science of Astrobiology (2002), 140. For most of history, man has had to fight nature to survive; in this century he is beginning to realize that, in order to survive, he must protect it. For the philosopher, order is the entirety of repetitions manifested, in the form of types or of laws, by perceived objects. Order is an intelligible relation. For the biologist, order is a sequence in space and time. However, according to Plato, all things arise out of their opposites. Order was born of the original disorder, and the long evolution responsible for the present biological order necessarily had to engender disorder. An organism is a molecular society, and biological order is a kind of social order. Social order is opposed to revolution, which is an abrupt change of order, and to anarchy, which is the absence of order. I am presenting here today both revolution and anarchy, for which I am fortunately not the only one responsible. However, anarchy cannot survive and prosper except in an ordered society, and revolution becomes sooner or later the new order. Viruses have not failed to follow the general law. They are strict parasites which, born of disorder, have created a very remarkable new order to ensure their own perpetuation. 'Interaction Among Virus, Cell, and Organism', Nobel Lecture (11 Dec 1965). In Nobel Lectures: Physiology or Medicine 1963-1970 (1972), 174. Humans everywhere share the same goals when the context is large enough. And the study of the Cosmos provides the largest possible context … . If a human disagrees with you, let him live. In a hundred billion galaxies, you will not find another … . If we are to survive, our loyalties must be broadened further, to include the whole human community, the entire planet Earth. I cannot imagine a God who rewards and punishes the objects of his creation, whose purposes are modeled after our own–a God, in short, who is but a reflection of human frailty. Neither can I believe that the individual survives the death of his body, although feeble souls harbor such thoughts through fear or ridiculous egotism. It is enough for me to contemplate the mystery of conscious life perpetuating itself through all eternity, to reflect upon the marvelous structure of the universe which we can dimly perceive, and to try humbly to comprehend even an infinitesimal part of the intelligence manifested in nature. From 'What I Believe: Living Philosophies XIII', Forum and Century (Oct 1930), 84, No. 4, 194. Article in full, reprinted in Edward H. Cotton (ed. ), Has Science Discovered God? A Symposium of Modern Scientific Opinion (1931), 97. I want to argue that the ‘sudden’ appearance of species in the fossil record and our failure to note subsequent evolutionary change within them is the proper prediction of evolutionary theory as we understand it ... Evolutionary ‘sequences’ are not rungs on a ladder, but our retrospective reconstruction of a circuitous path running like a labyrinth, branch to branch, from the base of the bush to a lineage now surviving at its top. If a small animal and a lighted candle be placed in a closed flask, so that no air can enter, in a short time the candle will go out, nor will the animal long survive. ... The animal is not suffocated by the smoke of the candle. ... The reason why the animal can live some time after the candle has gone out seems to be that the flame needs a continuous rapid and full supply of nitro-aereal particles. ... For animals, a less aereal spirit is sufficient. ... The movements of the lungs help not a little towards sucking in aereal particles which may remain in said flask and towards transferring them to the blood of the animal. Remarking (a hundred years before Priestley identified oxygen) that a component of the air is taken into the blood. Quoted in William Stirling, Some Apostles of Physiology (1902), 45. If one of these people, in whom the chance-worship of our remoter ancestors thus strangely survives, should be within reach of the sea when a heavy gale is blowing, let him betake himself to the shore and watch the scene. Let him note the infinite variety of form and size of the tossing waves out at sea; or against the curves of their foam-crested breakers, as they dash against the rocks; let him listen to the roar and scream of the shingle as it is cast up and torn down the beach; or look at the flakes of foam as they drive hither and thither before the wind: or note the play of colours, which answers a gleam of sunshine as it falls upon their myriad bubbles. Surely here, if anywhere, he will say that chance is supreme, and bend the knee as one who has entered the very penetralia of his divinity. But the man of science knows that here, as everywhere, perfect order is manifested; that there is not a curve of the waves, not a note in the howling chorus, not a rainbow-glint on a bubble, which is other than a necessary consequence of the ascertained laws of nature; and that with a sufficient knowledge of the conditions, competent physico-mathematical skill could account for, and indeed predict, every one of these 'chance' events. In 'On the Reception of the Origin of Species'. In Francis Darwin (ed. ), The Life and Letters of Charles Darwin, Including an Autobiographical Chapter (1888), Vol. 2, 200-1. If only the fit survive and if the fitter they are the longer they survive, then Volvox must have demonstrated its superb fitness more conclusively than any higher animal ever has. The Great Chain of Life (1957), 22. If we are correct in understanding how evolution actually works, and provided we can survive the complications of war, environmental degradation, and possible contact with interstellar planetary travelers, we will look exactly the same as we do now. We won’t change at all. The species is now so widely dispersed that it is not going to evolve, except by gradualism. In Pamela Weintraub, The Omni Interviews (1984), 75. In a dispassionate comparison of the relative values of human and robotic spaceflight, the only surviving motivation for continuing human spaceflight is the ideology of adventure. But only a tiny number of Earth’s six billion inhabitants are direct participants. For the rest of us, the adventure is vicarious and akin to that of watching a science fiction movie. In order to survive, an animal must be born into a favoring or at least tolerant environment. Similarly, in order to achieve preservation and recognition, a specimen of fossil man must be discovered in intelligence, attested by scientific knowledge, and interpreted by evolutionary experience. These rigorous prerequisites have undoubtedly caused many still-births in human palaeontology and are partly responsible for the high infant mortality of discoveries of geologically ancient man. Apes, Men and Morons (1938), 106. In true natural selection, if a body has what it takes to survive, its genes automatically survive because they are inside it. So the genes that survive tend to be, automatically, those genes that confer on bodies the qualities that assist them to survive. It is bad when the mind survives the body; and worse still when the body survives the mind; but, when both these survive our spirits, our hopes, and our health, this is worst of all. Reflection 324, in Lacon: Or Many Things in Few Words, Addressed to Those who Think (1820), 152. It is hard to think of fissionable materials when fashioned into bombs as being a source of happiness. However this may be, if with such destructive weapons men are to survive, they must grow rapidly in human greatness. A new level of human understanding is needed. The reward for using the atom’s power towards man’s welfare is great and sure. The punishment for its misuse would seem to be death and the destruction of the civilization that has been growing for a thousand years. These are the alternatives that atomic power, as the steel of Daedalus, presents to mankind. We are forced to grow to greater manhood. Atomic Quest: A Personal Narrative (1956), xix. It is not failure but success that is forcing man off this earth. It is not sickness but the triumph of health... Our capacity to survive has expanded beyond the capacity of Earth to support us. The pains we are feeling are growing pains. We can solve growth problems in direct proportion to our capacity to find new worlds... If man stays on Earth, his extinction is sure even if he lasts till the sun expands and destroys him... It is no longer reasonable to assume that the meaning of life lies on this earth alone. If Earth is all there is for man, we are reaching the foreseeable end of man. It is not the strongest of the species that survives, nor the most intelligent, but rather the one most responsive to change. It’s the lies that undo us. It’s the lies we think we need to survive. When was the last time you told the truth? Character in TV series, Homeland. Man not only survives and functions in his environment, he shapes it and he is shaped by it. In Barbara Ward and René Jules Dubos, Only One Earth: the Care and Maintenance of a Small Planet: an unofficial report commissioned by the Secretary-General of the United Nations Conference on the Human Environment (1972), 30. This is similar to the quote, “Man shapes himself through decisions that shape his environment,” which is commonly seen attributed to Dubos, but without citation. If you know the primary source of this wording of that quote, please contact webmaster. Mankind cannot survive without technology. But unless technology becomes a true servant of man, the survival of mankind is in jeopardy. And if technology is to be the servant, then the engineer’s paramount loyalty must be to society. In 'Preface', Conference on Engineering Ethics, May 18-19, 1975, Baltimore, Md. (1975), 1. From interview with Michael Amrine, 'The Real Problem is in the Hearts of Men', New York Times Magazine, (23 Jun 1946), 7. See more of the message from which Einstein quoted himself, see the longer quote that begins, “Our world faces a crisis as yet unperceived…,” on the Albert Einstein Quotes page of this website. Men first appeared as fish. When they were able to help themselves they took to land. These are certainly not exact words from Anaximander, though it summarizes Plutarch’s version of what Anaximander believed. Although the subject quote is widely seen, no original of Anaximander’s writings survived on this hypothesis. What we know of Anaximander is what other, later, ancient Greek writers handed down in a kind of ancient Greek telephone game. These include Hippolytus, Aetius and Plutarch. Their expressions of what Anaximander believed relate by a general theme, but notably differ in specifics. For the fragmentary evidence, see Felix M. Cleve, The Giants of Pre-Sophistic Greek Philosophy: An Attempt to Reconstruct Their Thoughts (2012), 145-148. An example of the subject quote is given by David M. Neuberger, without quotation marks: Anaximander said men were produced first in fishes and, that when they were able to help themselves, they were thrown up on the land. Opening sentence 'A Call to the Chemist to Purge Industry of its Contamination of Our Coast and Inland Waters', Chemical Age (Oct 1923), 31, No. 10, 431. Might one not say that in the chance combination of nature's production, since only those endowed with certain relations of suitability could survive, it is no cause for wonder that this suitability is found in all species that exist today? Chance, one might say, produced an innumerable multitude of individuals; a small number turned out to be constructed in such fashion that the parts of the animal could satisfy its needs; in another, infinitely greater number, there was neither suitability nor order: all of the later have perished; animals without a mouth could not live, others lacking organs for reproduction could not perpetuate themselves: the only ones to have remained are those in which were found order and suitability; and these species, which we see today, are only the smallest part of what blind fate produced. 'Essai de Cosmologie' in Oeuvres de Mr. De Maupertuis (1756), Vol. 1, 11-12. Quoted in Jacques Roger, The Life Sciences in Eighteenth-Century French Thought, ed. Keith R. Benson and trans. Robert Ellrich (1997), 381. Often in evolutionary processes a species must adapt to new conditions in order to survive. Today the atomic bomb has altered profoundly the nature of the world as we know it, and the human race consequently finds itself in a new habitat to which it must adapt its thinking. Often referred to as osteoporosis of the ocean, [ocean acidification] prevents shell building creatures such as lobster, oyster, crab, shrimp, and coral from extracting the calcium carbonate from the water that they need to build their shells and are thus unable to survive. In 'What do the Arctic, a Thermostat and COP15 Have in Common? ', Huffington Post (18 Mar 2010). Our obligation to survive and flourish is owed not just to ourselves, but also to the cosmos, ancient and vast, from which we spring. Our only complete assurance of surviving World War III is to halt it before it starts. Speech (10 Nov 1948) preceding Armistice Day, at Boston, Massachusetts. Penguins are an indicator of the health of our watery planet, and if they are unable to survive, we had better take notice or we might find our own survival threatened. Probably if half a kilogram [of radium] were in a bottle on that table it would kill us all. It would almost certainly destroy our sight and burn our skins to such an extent that we could not survive. The smallest bit placed on one’s arm would produce a blister which it would need months to heal. Science and technology were developing at a prodigious speed, and it seemed natural to assume that they would go on developing. This failed to happen, partly because of the impoverishment caused by a long series of wars and revolutions, partly because scientific and technical progress depended on the empirical habit of thought, which could not survive in a strictly regimented society. In 1984 (1949), Book 2, Chapter 9. The Foundations of Belief: Being Notes Introductory to the Study of Theology (1895), 134. Science was born as a result and consequence of philosophy; it cannot survive without a philosophical base. If philosophy perishes, science will be next to go. For the New Intellectual: The Philosophy of Ayn Rand (1963), 44. Some years ago John Kenneth Galbraith wrote in an essay on his efforts at writing a history of economics: “As one approaches the present, one is filled with a sense of hopelessness; in a year and possibly even a month, there is now more economic comment in the supposedly serious literature than survives from the whole of the thousand years commonly denominated as the Middle Ages … anyone who claims to be familiar with it all is a confessing liar.” I believe that all physicists would subscribe to the same sentiments regarding their own professional literature. I do at any rate. In H. Henry Stroke, 'The Physical Review Then and Now', Physical Review: The First Hundred Years: a Selection of Seminal Papers and Commentaries, Vol. 1, 1. Taking a very gloomy view of the future of the human race, let us suppose that it can only expect to survive for two thousand millions years longer, a period about equal to the past age of the earth. Then, regarded as a being destined to live for three-score years and ten, humanity although it has been born in a house seventy years old, is itself only three days old. But only in the last few minutes has it become conscious that the whole world does not centre round its cradle and its trappings, and only in the last few ticks of the clock has any adequate conception of the size of the external world dawned upon it. For our clock does not tick seconds, but years; its minutes are the lives of men. EOS: Or the Wider Aspects of Cosmology (1928), 12-3. The actions of bad men produce only temporary evil, the actions of good men only temporary good ; and eventually the good and the evil altogether subside, are neutralized by subsequent generations, absorbed by the incessant movements of future ages. But the discoveries of great men never leave us; they are immortal; they contain those eternal truths which survive the shock of empires, outlive the struggles of rival creeds, and witness the decay of successive religions. In History of Civilization in England (1858), Vol. 1, 206. The external world of physics has … become a world of shadows. In removing our illusions we have removed the substance, for indeed we have seen that substance is one of the greatest of our illusions. Later perhaps we may inquire whether in our zeal to cut out all that is unreal we may not have used the knife too ruthlessly. Perhaps, indeed, reality is a child which cannot survive without its nurse illusion. But if so, that is of little concern to the scientist, who has good and sufficient reasons for pursuing his investigations in the world of shadows and is content to leave to the philosopher the determination of its exact status in regard to reality. In Introduction to The Nature of the Physical World (1928), xiv. The Book of the Damned (1932). In The Complete Books of Charles Fort (1975), 24. The future of mankind is going to be decided within the next two generations, and there are two absolute requisites: We must aim at a stable-state society [with limited population growth] and the destruction of nuclear stockpiles. … Otherwise I don't see how we can survive much later than 2050. Quoted in John C. Hess, 'French Nobel Biologist Says World Based On Chance', New York Times (15 Mar 1971), 6. The Works of Francis Bacon (1824), Vol. 6, 24. The moral principle inherent in evolution, that nothing can be gained in this world without an effort; the ethical principle inherent in evolution is that only the best has the right to survive; the spiritual principle in evolution is the evidence of beauty, of order, and of design in the daily myriad of miracles to which we owe our existence. 'Evolution and Religion', New York Times (5 Mar 1922), 91. The problem [evolution] presented itself to me, and something led me to think of the positive checks described by Malthus in his Essay on Population, a work I had read several years before, and which had made a deep and permanent impression on my mind. These checks—war, disease, famine, and the like—must, it occurred to me, act on animals as well as man. Then I thought of the enormously rapid multiplication of animals, causing these checks to be much more effective in them than in the case of man; and while pondering vaguely on this fact, there suddenly flashed upon me the idea of the survival of the fittest—that the individuals removed by these checks must be on the whole inferior to those that survived. I sketched the draft of my paper … and sent it by the next post to Mr. Darwin. In 'Introductory Note to Chapter II in Present Edition', Natural Selection and Tropical Nature Essays on Descriptive and Theoretical Biology (1891, New ed. 1895), 20. The rate of extinction is now about 400 times that recorded through recent geological time and is accelerating rapidly. If we continue on this path, the reduction of diversity seems destined to approach that of the great natural catastrophes at the end of the Paleozoic and Mesozoic Eras, in other words, the most extreme for 65 million years. And in at least one respect, this human-made hecatomb is worse than any time in the geological past. In the earlier mass extinctions… most of the plant diversity survived even though animal diversity was severely reduced. Now, for the first time ever, plant diversity too is declining sharply. The stream of thought flows on but most of its segments fall into the bottomless abyss of oblivion. Of some, no memory survives the instant of their passage. Of others, it is confined to a few moments, hours or days. Others, again, leave vestiges which are indestructible, and by means of which they may be recalled as long as life endures. The Struggle for Existence amongst all organic beings throughout the world, which inevitably follows from their high geometrical powers of increase ... This is the doctrine of Malthus, applied to the whole animal and vegetable kingdoms. As many more individuals of each species are born than can possibly survive; and as, consequently, there is a frequently recurring struggle for existence, it follows that any being, if it vary however slightly in any manner profitable to itself, under the complex and sometimes varying conditions of life, will have a better chance of surviving, and thus be naturally selected. From the strong principle of inheritance, any selected variety will tend to propagate its new and modified form. From On the Origin of Species by Means of Natural Selection; or, The Preservation of Favoured Races in the Struggle for Life (1861), 12. The theory of the lung as a gland has justified its existence and done excellent service in bringing forward facts, which shall survive any theoretical construction that has been or may hereafter be put upon them. From The Mechanism of gas Exchange (1910), 257, as cited by E. Snorrason, 'Krogh, Schack August Steenberg', in Charles Coulton Gillispie (ed. ), Dictionary of Scientific Biography (1973), Vol 7, 502. The universe is governed by science. But science tells us that we can’t solve the equations, directly in the abstract. 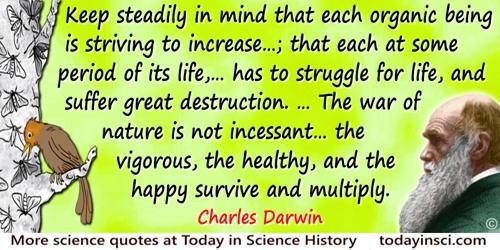 We need to use the effective theory of Darwinian natural selection of those societies most likely to survive. We assign them higher value. 'Stephen Hawking: "There is no heaven; it’s a fairy story"', interview in newspaper The Guardian (15 May 2011). There are many hypotheses in science which are wrong. That’s perfectly all right; they’re the aperture to finding out what’s right. Science is a self-correcting process. To be accepted, new ideas must survive the most rigorous standards of evidence and scrutiny. Quoted in Donald R. Prothero and Carl Dennis Buell, Evolution: What the Fossils Say and Why it Matters (2007), 3. To expect a personality to survive the disintegration of the brain is like expecting a cricket club to survive when all of its members are dead. We must therefore bear the undoubtedly bad effect s of the weak surviving and propagating their kind; but there appears to be at least one check in steady action, namely that the weaker and inferior members of society do not marry so freely as the sound; and this check might be indefinitely increased by the weak in body or mind refraining from marriage, though this is more to be hoped for than expected. What is truth? In matters of religion it is simply the opinion that has survived. In matters of science it is the ultimate sensation. In matters of art it is one’s last mood. In 'The Critic As Artist', Oscariana: Epigrams (1895), 8. Also in Sebastian Melmoth (1908), 42. What matters in science is the body of findings and generalizations available today: a time-defined cross-section of the process of scientific discovery. I see the advance of science as self-erasing in the sense that only those elements survive that have become part of the active body of knowledge. In A Slot Machine, A Broken Test Tube (1985), 123. What these two sciences of recognition, evolution and immunology, have in common is not found in nonbiological systems such as 'evolving' stars. Such physical systems can be explained in terms of energy transfer, dynamics, causes, and even 'information transfer'. But they do not exhibit repertoires of variants ready for interaction by selection to give a population response according to a hereditary principle. The application of a selective principle in a recognition system, by the way, does not necessarily mean that genes must be involved—it simply means that any state resulting after selection is highly correlated in structure with the one that gave rise to it and that the correlation continues to be propagated. Nor is it the case that selection cannot itself introduce variation. But a constancy or 'memory' of selected events is necessary. If changes occurred so fast that what was selected could not emerge in the population or was destroyed, a recognition system would not survive. Physics proper does not deal with recognition systems, which are by their nature biological and historical systems. But all the laws of physics nevertheless apply to recognition systems. Bright and Brilliant Fire, On the Matters of the Mind (1992), 79. When a conjecture inspires new hopes or creates new fears, action is indicated. There is an important asymmetry between hope, which leads to actions that will test its basis, and fear, which leads to restriction of options frequently restricting testing of the basis for the fear. As we know only too well, many of our hopes do not survive their tests. However, fears accumulate untested. Our inventory of untested fears has always made humanity disastrously vulnerable to thought control. While science was independent of politics, its greatest triumph was the reduction of that vulnerability. With savages, the weak in body or mind are soon eliminated; and those that survive commonly exhibit a vigorous state of health. We civilised men, on the other hand, do our utmost to check the process of elimination; we build asylums for the imbecile, the maimed, and the sick; we institute poor-laws; and our medical men exert their utmost skill to save the life of every one to the last moment. Quoted in S. Benison, A. C. Barger and E. L. Wolfe, Walter B Cannon: The Life and Times of a Young Scientist (1987), 311.